The class is a shame-free zone and everyone goes at their own speed, which keeps you moving from beginning to end. The puddles of sweat almost reminded me of a post-modern art canvas. The streaks are irregular but seem to follow a pattern. There’s an art to it. 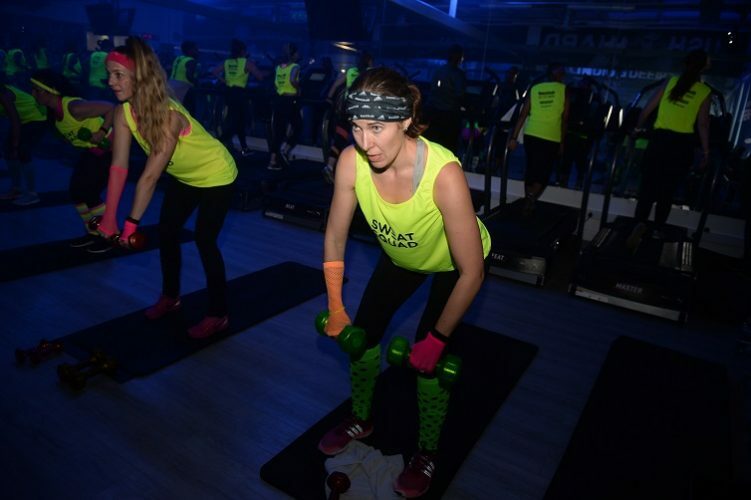 Sweat 1000 is where fitness merges with the art of burning calories effectively. 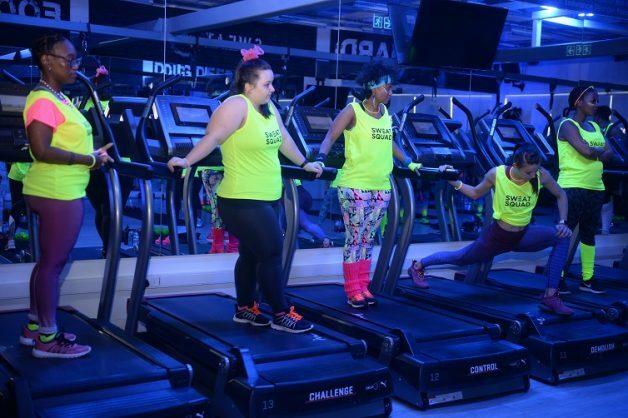 In a 60-minute class you can burn up to 1 000 calories (that’s a whole amagwinya and polony with mounds of cheese), making these classes popular among people with limited time. But relative fitness aside, at one of these classes the most essential asset is hearing and a towel. 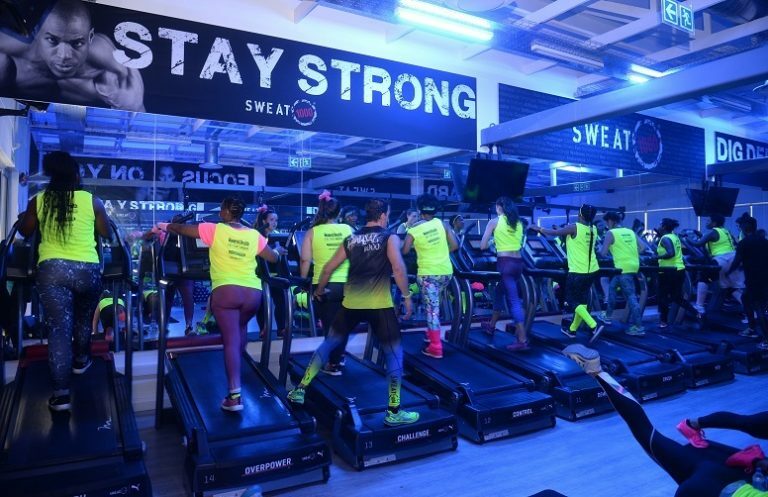 Ahead of Fibo Global Fitness Africa at the Ticketpro Dome next weekend, I joined one of Mika Stefano’s Sweat 1000 classes at the Illovo studio in Joburg and learnt one valuable lesson – you can surprise yourself. I consider myself relatively fit so the idea of a class combining cardio and strength training didn’t scare me, but I’m fully aware that when it comes to stamina I’m a sub-seven at best. That’s the twist to Sweat 1000 – if you are relatively active you should be able to keep up – even if every muscle in your body screams for days after the class. The 5.15pm class last week was split in half so when half of the class is on the floor, the other half is on the treadmills. One of the first things we did on the floor was a set of the dreaded burpees. Stefano motivates from all over the room and you have to keep up as he gives instructions for both groups. Floor exercises included push-ups, lunges and jumping jacks. There are weights to further challenge participants. The treadmill is where Sweat 1000 gets interesting. There are three speeds: for walkers, joggers or runners. I often switched to walking speed as there is no break so you get winded quickly. But the strenuous exercise never gets overwhelming, thanks to a few factors. The first is an endless stream of hits blasting from the stereo and keeping an ear out for the trainer for the next set of instructions. That means you never really have time to think how you are pushing yourself. In terms of interval training, that’s great because a moment of boredom can quickly see you lose your pace. The class is also a shame-free zone and everyone goes at their own speed, which keeps you moving from beginning to end. Well, Sweat 1000 is a 360° experience. For the price of the class you get full use of the equipment and the cloak rooms. It’s advisable to be moderately fit to get the most out of the class and it’s a great introduction to interval training if you don’t want to pay monthly gym fees. You need to pre-book classes from the website (just to ensure your spot). Other than that you just need to show up with a bottle of water and a towel (and you’ll need your towel). Will you really sweat away 1 000 calories? That depends but my wearable device tracked 656 calories burned and I cheated and missed a few push-ups and lunges. But the goal should be to get a full-body workout in 60 minutes. Mika Stefano lost 30kg thanks partially to Sweat 1000. If you want to meet him to go over the nitty-gritty of diet and exercise, he’ll be at Fibo next weekend. For tickets to Fibo visit Computicket.